Does your home have a basement? 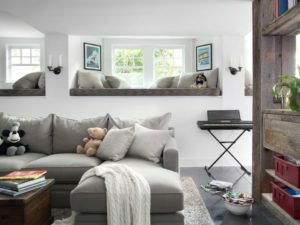 Well it’s time to stop treating your basement as the “catch all” for the clutter in your home, and it’s time to make the most of the space you have. You might be surprised to learn all the fun ways that you can utilize your basement that are hardly boring. You could increase the square footage and value of your home by simply capitalizing on your basement’s potential! Here are a five super cool things that you can do with your basement. Have you always wanted a quiet, cozy place where you can escape “normal” life and dive into a good novel? Maybe you just want a few moments away from the kids to catch your breath and refocus. You might even be a student who needs a good place to study without extra distractions. If you have been trying to find just the right place to create your little oasis, your basement might be just the spot! Typically basements are quieter than any other part of the house as most of the “living” takes place upstairs. Stop wasting time and gas driving to a library in town when you can have your own nook right in your basement. Here are some pretty awesome basement dens that will leave you inspired to try it yourself! With technology as it is today, you can create a full theatrical experience right in your own home. The days of having to go to a public theater for entertainment is rapidly coming to an end. Home theaters are on the rise and in impressive fashion. For example, you can purchase a 4K projector, a surround sound system, and lighting as you desire to accompany the setup all with the click of a button through Amazon, Walmart, or any other online shopping hub you prefer. You can even purchase a popcorn machine and a mini fridge with all of your favorite beverages on hand during movies, sporting games, or even during the nightly news. Here are some impressive home theaters to spark your imagination! Are you tired of paying $30+ a month for a gym membership that you hardly use? Now you can purchase the same equipment that the gym offers and create your own home gym right in your basement. Basements are a popular place for home gyms because they are typically cooler and you can enjoy a full workout without interrupting anyone else in your home. You can have yoga mats, free weights, resistance bands, treadmills, ellipticals, and so much more delivered right to your home with the click of a button. There is no reason not to convert your basement into your favorite workout spot. Get motivated with these awesome home gyms! Are you a wine lover? Consider transforming your basement into your very own wine cellar. Bring California or the taste of Italy right to your own home! Check out these awesome ideas from some other wine fanatics who created their very own wine cellar. Whether it’s your in-laws or your out-laws, an extra living space is always handy when you have guests. Adding a living space in your basement offers both you and your guests privacy. If your basement is large and relatively open, you could easily frame out a small bedroom and add a bathroom where the piping is already run for your bathrooms upstairs. You could even add a small kitchenette and living room with a dining room or breakfast nook adjoining. If there is an exterior door going out of your basement, you could paint it and get a special lock and key that is reserved for guests. If you have windows in your basement, try adding some indoor plants to spruce up the area. Regardless of how you want to utilize the space in your basement, just be sure that it’s not wasted. However, before you do anything in your basement, make sure to have a professional waterproofing company inspect your basement for water intrusion risks and make sure that your investments are protected in the future. If you are in the Cleveland, TN area, give us a call!